Photos (clockwise from left) via Lolly Jane, Beau Coup, Ella Claire, and Back Bay Pottery. Designing a Shabby Chic nursery? Time to get your DIY on! Vintage glam meets homemade charm in this adorable round up of easy and inexpensive nursery projects. Choose your favorite, or try your hand at all of them! From delicate wall-art to clever and attractive storage ideas, you'll find the inspiration you need to help make your Shabby Chic nursery or kid's room one-of-a-kind. Photo via Back Bay Pottery. Keep your little girl's room neat and chic by turning a thrift-store frame into a beautiful bow organizer for all those adorable hair clips and bows! See the full tutorial from Back Bay Pottery. A curved shower-curtain rod makes for an inexpensive and easy-to-install bed canopy for a sweet little girl’s room. See how this clever, no-sew project came together over at The Lily Pad Cottage. Shimmering crystals set against rustic burlap give this simple mobile the perfect, Shabby Chic aesthetic. Make your own using these detailed instructions from God Bless Our Nest. Made from a non-skid mat and odds and ends of spare fabric, this scrappy little floor rug couldn’t be more adorable! All you need is a latch hook tool and a little patience. Learn how to make your own rag rug with this great tutorial from Craftaholics Anonymous. 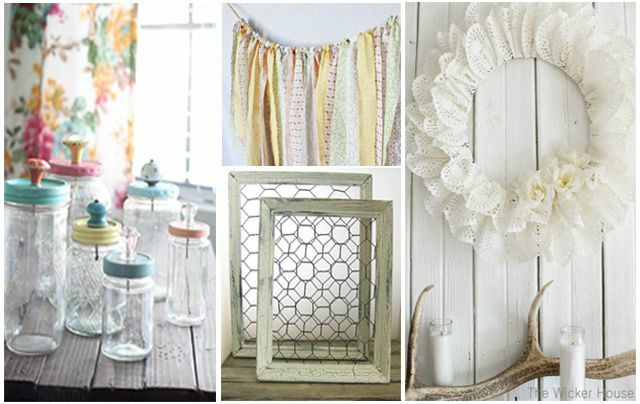 Scraps of pretty, floral fabric and lace come together to make colorful nursery bunting project. Simply cut assorted fabrics into long strips and tie onto a piece of twine, slightly staggering the length of each piece as you go. For more tips, check out this project guide from Beau-coup.com. Have a glue-gun and some scrap fabric? Turn a plain-Jane lampshade into a blossoming work of art. Easy, DIY tutorial from Jennifer at Simply Ciani. This lovely, lacy wall wreath made from paper doilies is a great way to add a soft, feminine touch to your little one's space. It'll only take you about 20 minutes and cost less than $5 to make! Find the full tutorial on Ella Claire Inspired. Repurposed drawer pulls give these hand-painted mason jars vintage charm. Create your own collection and use them to organize your toddler’s hair bows and jewelry. Looking for inexpensive wall art? Create colorful wall hangings using fabric scraps and inexpensive embroidery hoops. Want to take the cuteness factor up a notch? Try sewing on buttons, crystals, flowers and other pretty charms! Spotted on The Sweetest Occasion. Create space-saving under-the-bed storage with Shabby Chic flair! All you need is a couple of vintage, thrift-store suitcases, a can of pretty pastel paint, and a few cheap sets of caster wheels. Like what you see? Make your own vintage suitcase storage with these great tips from Cape 27. With a few thrift-store doilies, a beach ball and a little Mod Podge, you can create this fabulous lace lamp for less than $5! As if that wasn't fantastic enough, the finished product casts gorgeous lacy shadows on the wall for a look that's as romantic as it is chic. Want to make your own? You'll find directions right here on The Eco Owl. Can’t afford a crystal chandelier for your baby’s bedroom? Create your own! You won’t believe what a coat of paint and a few pretty bits and bobs can do for a cheap thrift-store find! Learn how with this detailed tutorial from Crafty Nest.